In more than two-thirds of cases arising from food-borne illnesses, the cause of the illness is never identified. However, the Food and Drug Administration has recently been using whole genome sequencing to track down the pathogens responsible for tainted foods in an effort to thwart outbreaks. Researchers at IBM Research and Mars Incorporated are also undergoing a project to sequence the DNA of the food supply chain to get a baseline of safe food ingredients. Ari Rosenson began his culinary career at 16 working at Spago West Hollywood, eventually working his way up to executive sous-chef at Spago Beverly Hills. 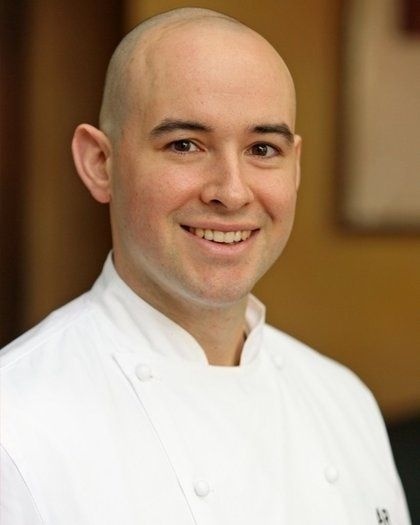 He is now executive chef at CUT Beverly Hills, where he is dedicated to serving the best meats and farmers market vegetables. His dishes are inspired by the simplicity of Italian cuisines. Two things got me hooked. I love the fact that something so simple as cooking a meal for someone can make them so happy. 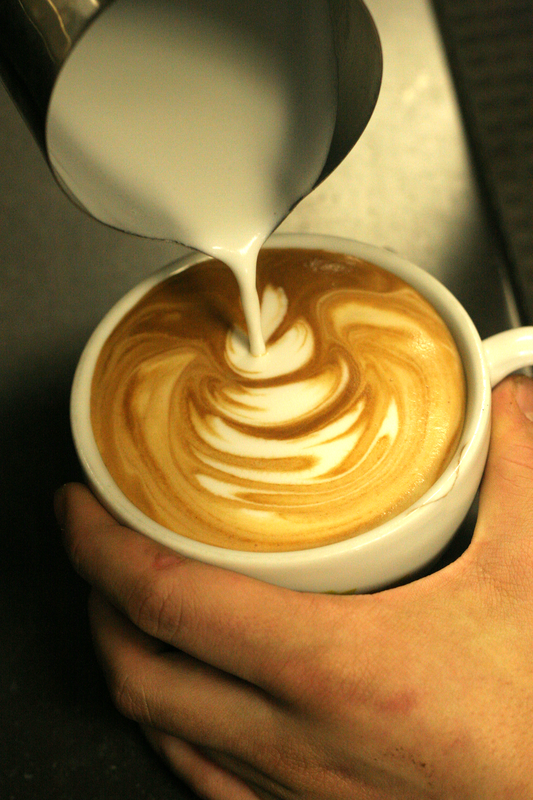 This is a great form of instant gratification. The alchemy of cooking is very fun. The fact that there are endless learning opportunities keeps my curiosity satiated. Playing with fire… Simple adjustments to the formula that affects the quality of the fire you are working with and how that controls the quality and speed of cooking process of the food I am manipulating. I find this to be very cool. I can’t say that there is just one or a group of foods that I find fascinating. I find all food fascinating and the fact that there are endless possibilities to what you can do with it amazes me. Evolution intertwined with Causality. How we evolve as a species, the history of what we have done, are doing and are planning on doing to ourselves and the environment around us is very interesting. This can relate to food in whole or in part. For example, global warming has a profound effect on weather patterns thus having an effect on our food production and so on and so on. I can’t really come to a conclusion with this question. All food is better because of science. If we didn’t have science and food we would still be cooking our food around a fire like cavemen. Negatively. I think that we overanalyze data when it comes to food safety and create laws that might seem to make food safer but effectively changes chefs physical practices. Too much of a nanny state can be a dangerous thing. My knife. You really can’t do anything without cutting it down to size first. Coffee plus everything in question #8 (with the exception of the pickles.) Nothing like a simple scrambled egg sandwich on toast with avocado and a little srircha on the side. Thenghu chathikkilla is an old adage in Malayalam which translates to, “a coconut tree won’t let you down.” Well, meet the double coconut tree (Lodoicea maldivica), which bears the largest seed known to science (25 kg), can live up to 1000 years, and (according to legend) can confer immunity against poisons. 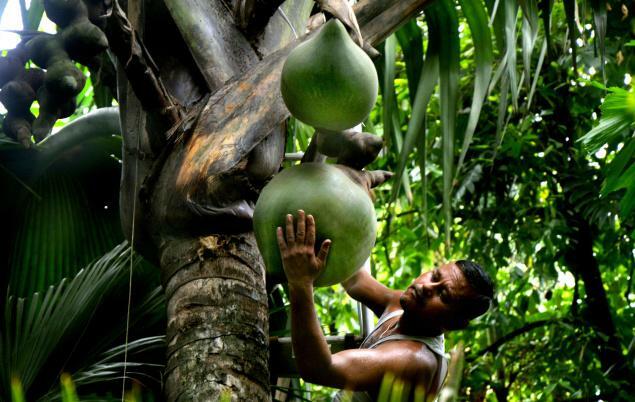 The problem is, there’s only one double coconut tree planted in India and it’s a globally threatened species. Scientists from the Botanical Survey of India spent decades researching ways to preserve this near-mythical tree. Heat got you craving for a bottle of something hydrating? Registered dietitian and nutritionist Ellie Krieger gives a breakdown on the different types of waters on the market, from bottled waters to plant-derived waters and explains the benefits each one offers (or doesn’t). 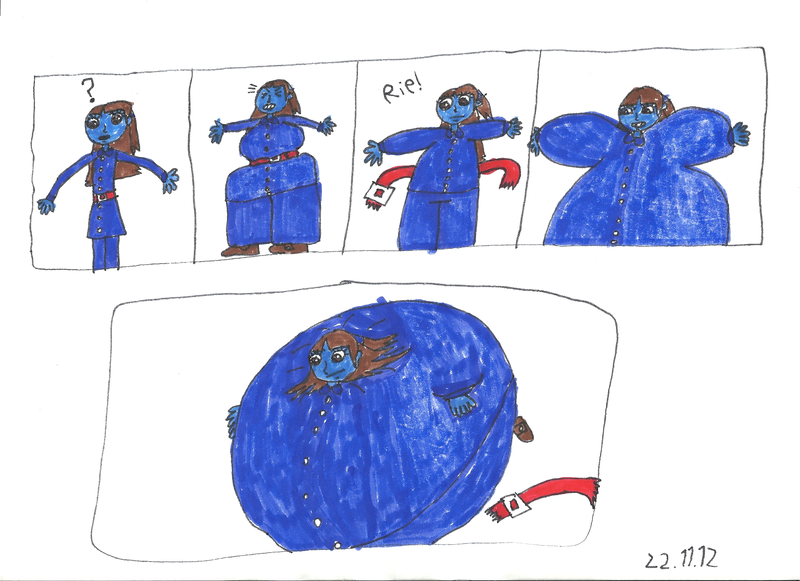 Growing up as a chubby kid who tried to convince her parents that candy belonged at every meal (a real life Augustus Gloop, if I may), one of my favorite books was Charlie and the Chocolate Factory. And though I’d dream for a mug of the chocolate river, my favorite of Willy Wonka’s creations was the three-course chewing gum. Tomato soup, roast beef, and blueberry pie in one piece of gum? The possibilities! While you can find some commercial versions of flavor-changing gum at the supermarket today, my fingers are crossed for a three-course meal sometime in the near future. To get any sort of flavor in a chewing gum in the first place, a process called microencapsulation is used, in which a core of tiny flavor particles is surrounded by a shell coating to produce minuscule spherical capsules – we’re talking diameters of roughly a couple hundred micrometers in size . Chewing gums contain these little flavor microcapsules; the core of each microcapsule is usually some sort of liquid flavoring, and the shell is made of crosslinked proteins which stabilize the core material, isolate the core from the chewing gum base, and will break apart in response to the shear forces of chewing to release the core flavoring . So let’s say you have a stick of strawberry-flavored chewing gum. The gum will be studded and mixed with microcapsules filled with strawberry flavoring oils; those are the beady dots you sometimes see on the chewing gum surface. The fruity flavor is released once you chew on the gum and break open the shells of the strawberry capsules to release the flavoring oils in your mouth. 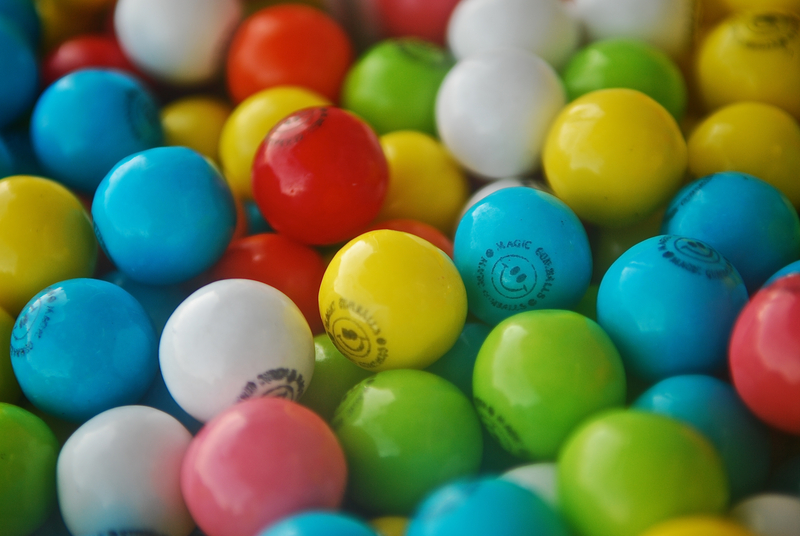 While there are various methods for flavor encapsulation, the technique which is used to make the capsules in chewing gum is the chemical process called complex coacervation. This process involves an aqueous solution with two or more oppositely charged polymers – one with positive charge (such as gelatin or agar), and another with negative charge (such as carboxymethylcellulose or gum arabic) . These two polymers are diluted into water and then controlled for both pH and temperature, so that when an oily substance (such as a flavoring oil) is mixed into the solution, the molecules form a chemically crosslinked, shell-like film around each of the oil particles, resulting in the encapsulated flavor beads present in chewing gum! 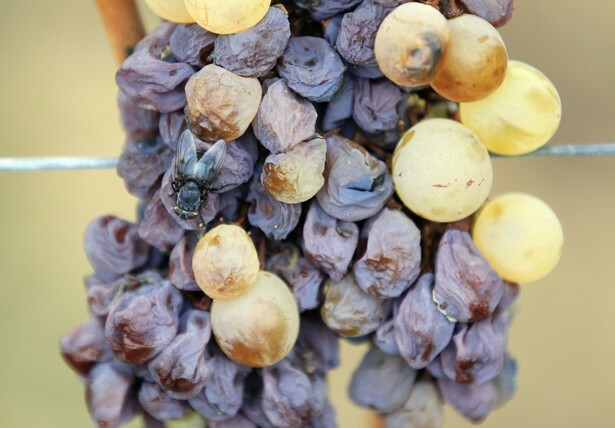 The coacervation solution then separates into two liquid phases – one called a “coacervate” that contains the many tiny oily droplets that contain the polymers and the other is called the “equilibrium liquid”, which serves as the solvent. Once the shells around the oil droplets are formed, the rest of the solution is washed out and the entire capsules are dried so that they can be incorporated into the chewing gum base . 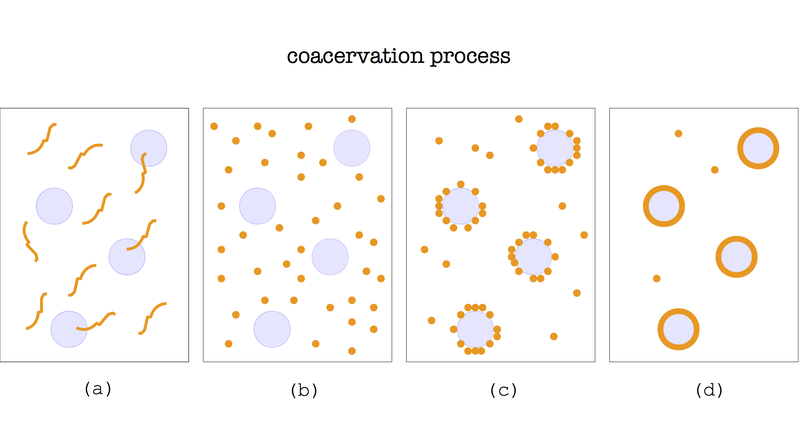 The Coacervation Process: (a) The oily flavor droplets float around in an emulsion of the shell polymer solution, (b) The coacervation solution separates into the coacvervate and the solvent (c) The coacervate surrounds the outside of the flavor core, (d) And forms a continuous crosslinked polymer shell around the core. So how does the flavor-changing gum work? The secret lies in the fact that the tiny flavor capsules in a chewing gum can be engineered to release at different times. By creating microcapsules with different dissolution times, the release of several different flavor capsules can be staggered to make a chewing gum that “changes flavors”. 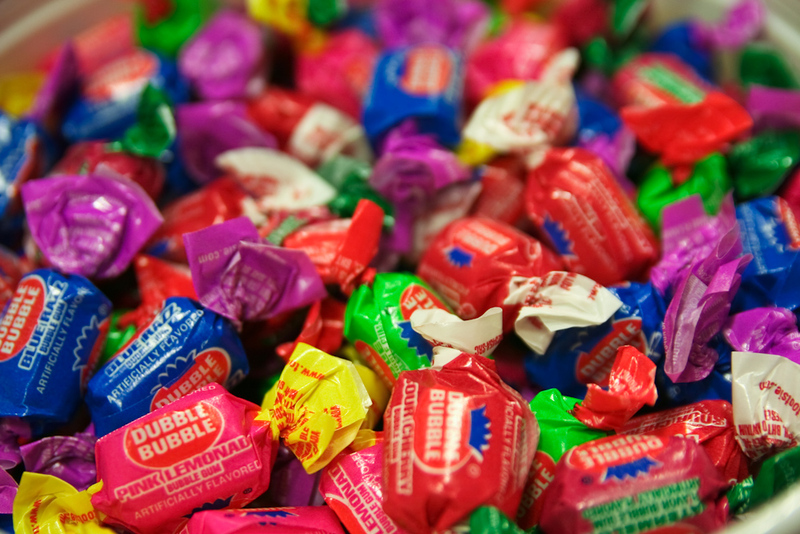 The first flavor composition in a flavor-changing gum is usually the unencapsulated liquid flavor or a starch sugar coating on the surface of the gum, so that the first flavor can be released on contact with saliva . Water-soluble flavoring substances are more soluble in our saliva, so they are released in chewing gum before the oil-soluble flavoring substances. Water-soluble flavors include vanilla, synthetic fruit flavors like cherry and lemon, and plant extracts such as coffee and licorice. Oil-soluble flavors include cinnamon oil, peppermint oil, peanut butter flavor, chocolate, and eucalyptus oil . Microcapsule shells made of highly hydrophobic proteins, meaning they have low water-absorption properties, take longer to release the core flavor. Meanwhile, shells that are made with less hydrophobic material, which can absorb more water, release the flavor components earlier and more quickly. For example, if we use ethylene-vinyl acetate as the shell material, the release rate can be controlled with a few adjustments. A higher ratio of ethylene to vinyl acetate creates a more hydrophobic shell, which results in a slower release of flavor. On the other hand, using lower ratio of ethylene would create a less hydrophobic shell and a quicker release of flavors . The maximum amount of stress that the encapsulation shell can withstand from chewing before it breaks and releases the core flavor is called the tensile strength. Changing the tensile strength of each flavor’s shell can determine the order in which the flavors are perceived. 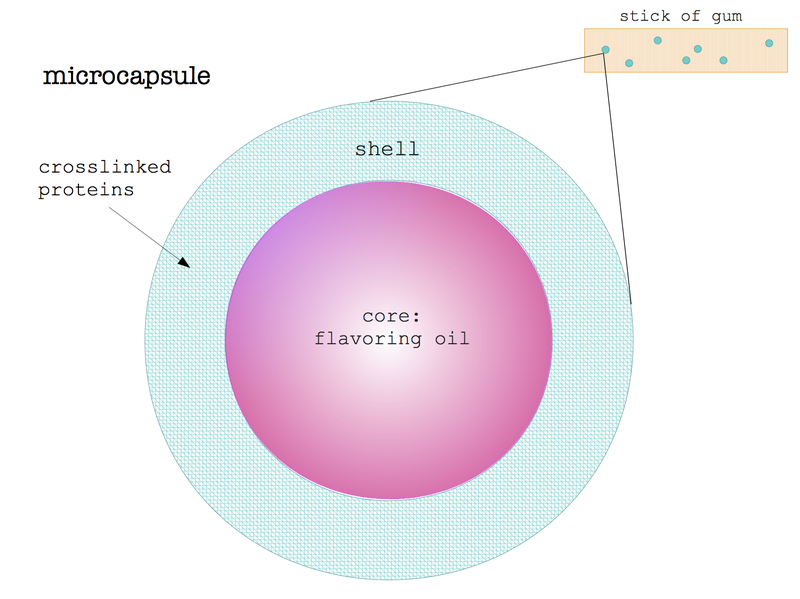 Materials that lower the shell’s tensile strength are fats, plasticizers, waxes, and emulsifiers, so adding these materials into the shell of a flavor capsule causes it to break more easily and release flavors more quickly . Meanwhile polymers with high molecular weight tend to increase the tensile strength of the shell, so these flavors are released later, since they require more vigorous chewing. A combination of these factors from hydrophobicity to tensile strength can be used to determine the order of the flavors released for an entire three-course meal (or more!) in just a stick of gum. Tomato soup, roast beef, and blueberry pie, here I come! J. Sris, A. Seethadevi, K. Suria Prabha, P. Muthuprasanna, and P. Pavitra. (2012). Microencapsulation: a review. International Journal of Pharma and Bio Sciences. 3: 509–521. Feng T., Xiao Z., Tian H. (2009). Recent Patents in Flavor Microencapsulation. Recent Patents on Food, Nutrition, & Agriculture. 1:193–202. Xiao Z., Liu W., Zhu G., Zhou R., Niu Y. (2014). A review of the preparation and application of flavour and essential oils microcapsules based on complex coacervation technology. Journal of the Science of Food and Agriculture. 94: 1482-1494. Gaonkar A.G., Vasisht N., Khare A.R., Sobel R. (2014). Microencapsultion in the Food Industry: A Practical Implementation Guide. Academic Press. 421-453. Lenzi S., Kar S., Michaelidou T.A., and Harvey J.E. (2012). Chewing Gum Compositions Providing Flavor Release Profiles. Kraft Foods Global Brands LLC, assignee. Patent WO2012034012. 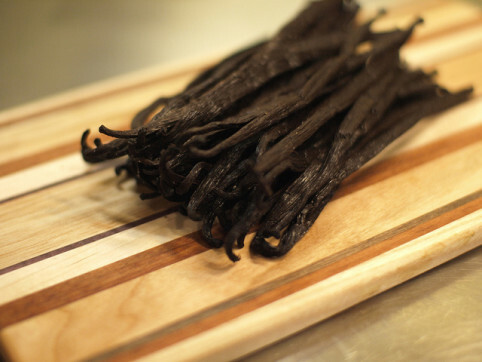 The vanillin (major flavor compound in vanilla beans) found in most food products on the market is derived from a three-step synthetic process that converts the molecule guaiacol to vanillin. Both natural and chemical methods for this conversion has shown to be expensive and environmentally burdensome, but biotech company Gen9 is providing a more promising route to synthesize vanillin that begins with glucose, using yeast to “ferment it just like beer.” David Chang of Momofuku and microbiologist Ben Wolfe further elaborate on how microbes may very well be the future of food.